سالاری, ممند, شهابی, هیمن, سالاری, سامرند. (1397). مدیریت(شناسایی و اولویت‌بندی) ژئومورفوسایت‌ها با استفاده از مدل‌های Entropy و Saw، مطالعه موردی: ژئومورفوسایت‌های شهرستان سردشت. پژوهشهای ژئومورفولوژی کمّی, 4(4), 166-180. ممند سالاری; هیمن شهابی; سامرند سالاری. "مدیریت(شناسایی و اولویت‌بندی) ژئومورفوسایت‌ها با استفاده از مدل‌های Entropy و Saw، مطالعه موردی: ژئومورفوسایت‌های شهرستان سردشت". پژوهشهای ژئومورفولوژی کمّی, 4, 4, 1397, 166-180. سالاری, ممند, شهابی, هیمن, سالاری, سامرند. (1397). 'مدیریت(شناسایی و اولویت‌بندی) ژئومورفوسایت‌ها با استفاده از مدل‌های Entropy و Saw، مطالعه موردی: ژئومورفوسایت‌های شهرستان سردشت', پژوهشهای ژئومورفولوژی کمّی, 4(4), pp. 166-180. سالاری, ممند, شهابی, هیمن, سالاری, سامرند. مدیریت(شناسایی و اولویت‌بندی) ژئومورفوسایت‌ها با استفاده از مدل‌های Entropy و Saw، مطالعه موردی: ژئومورفوسایت‌های شهرستان سردشت. پژوهشهای ژئومورفولوژی کمّی, 1397; 4(4): 166-180. 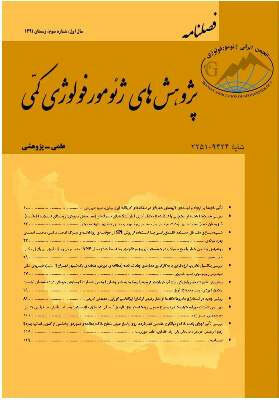 در این پژوهش، با یک نگرش مدیریتی و سیستمی به شناسایی، بررسی و اولویت­بندی ژئومورفوسایت­های شهرستان سردشت پرداخته‌شده است. روش کار بر مبنای مطالعات تئوریک، میدانی و به‌کارگیری مدل­های تصمیم­گیری چند شاخصه(MADAM) و به‌صورت موردی روش­های Saw و Entropy و نیز ابزارهای تحقیقی نقشه و GPS باهدف تجزیه‌وتحلیل بوده است. برای نیل به هدف، پنج ژئوسایت(گزینه) شناسایی و با چهار معیار و شاخص تأثیرگذار شامل جذابیت بصری سایت، دسترسی و میزان برخورداری، آمادگی برای توسعه زیرساخت‌ها و تعداد جاذبه­های گردشگری بر اساس آنتروپی و نیز آنتروپی تعدیل‌شده مورد ارزیابی قرار گرفتند. به‌عنوان نتیجه، خروجی حاصل از وزن دهی شاخص­ها در هر دو روش یکسان حاصل گردید که دال بر دقت مطالعاتی است. در مرحله بعد با نتایج موجود و بر اساس روش Saw، اولویت­بندی ژئومورفوسایت­ها به ترتیب شامل A1(آبشار شلماش)،A2(سایت چشمه گراوان)،A4(سایت بیوران)، A5(سایت رودخانه زاب) و A3(سایت دشت وزنه) برآورد گردیدند. واکاوی مسئله که به‌نوعی نتیجه اصلی پژوهش محسوب می­شود، بیانگر نقش اصلی شاخص­های طبیعی موردبررسی همچون جذابیت بصری( منحصربه‌فرد بودن) و نیز تعدد جاذبه­های گردشگری در پیرامون هر ژئوسایت همراه با نقش شاخص­های مدیریتی و انسانی همچون فضا و آمادگی ژئوسایت­ها و دسترسی به‌صورت ترکیبی در انتخاب ژئوسایت­های برتر است. در تأیید این مسئله می­توان به ژئوسایت دشت وزنه به‌صورت مقایسه­ای با دیگر ژئوسایت­ها اشاره کرد که معیار عدم دسترسی مناسب و عدم میزان برخورداری از امکانات حداقلی باعث شده است که در اولویت آخر قرار گیرد. پس می­توان به‌عنوان نتیجه نهایی اشاره کرد که روش­های موردمطالعه در این پژوهش به‌صورت تلفیقی در توان­سنجی و شناسایی نقاط ضعف و قوت و نهایتاً مدیریت ژئومورفوسایت­ها باهدف ایجاد ژئوتوریسم موفق پایدار و نیز توسعه پایدار مناطق به‌ویژه توانمند ولی محروم بسیار مؤثر هستند. به‌عنوان نمونه در مورد مدیریت ژئومورفوتوریسم سردشت مشخص گردید که پتانسیل­های ژئومورفوتوریسمی متعددی وجود دارد که به‌ویژه با توجه به مرزی بودن و وجود توریسم بازار، در صورت بالا بردن شاخص­های مدیریتی همچون توسعه و بهبود راه‌های ارتباطی و دسترسی و نیز ایجاد فضا در سطح ژئوسایت­ها، یک تحول در جریان ژئومورفوتوریسم و پایداری محیطی و نیز توسعه پایدار منطقه ایجاد می­گردد. In fact nowadays tourism has become a dynamic and pervasive industry in the form of a worldwide system, so that it can be said that it is one the most successful industries in the world. Thus nowadays new concepts have appeared in tourism field and it is divided into different parts with different motives and goals. Among these new concepts and fields, geotourism has been introduced as one of the most common kinds of tourism in countries of the world. For more specialized, Geomorphotourism, was initially defined as a tourism which includes geographical features of a site, it also includes environment, culture, aesthetics, heritage and inhabitants. Thus Geomorphosites are significant capabilities in the formation of stable tourism, But Planning and systematical management are very important in this process. management view and multi-attribute decision making models (Entropy and Saw models. Regarding subject of study, research method was based on library and field study and statistical analysis as well as using mathematical models (multi-attribute decision making), contain Entropy and Saw models. In addition, topography and geology maps with GPS were other research material and tools. Then, Entropy method is used for evaluation of values for indexes of a multiple- attribute- decision- making. In other words, entropy in information theory is a scale for degree of non certainty defined by a probabilistic distribution (P < sub>i). Then for calculation of weight of each index, we have following relation according Adjusted Entropy: is symbol of irregularity and is weight related to index j. At first, the five Geosites include: A1: Shalmash waterfall,A2:Calcic spring of Gravan, A3: Vazne Plain,A4:Bevran andA5:Zab region were identified. Then, based on four indicators as :x1:visual attraction of site, x2: access to site and having recreational and service centers, x3: extendible space or site readiness developing infrastructuresAnd x4: number of tourist attractions of site, analyzed. Four this goal: Decision-making matrix was determined based on view of DM for 5 Geosites and 4 indexes.Due to the variety of Geosites and indexes, values in the matrix from 1 to 9 are different. In addition, result from scaleless in order to calculations( normalized vector) involve a different numerical range. In the next step, through Entropy, Geosites were evaluated and weighted. The results were as follow: W1'= 0.0670 , W'2 = 0.7604 W'3= 0.1035 , W'4 = 0.0690. So, Therefore, in accordance with Entropy model: A'2 . To carefully study and validation, adjusted entropy was used. Result of adjusted Entropy was the same as result obtained from Entropy. By systematic approach that has been used in this study, it was found the study area due to the internal and external dynamics processes (tectonic and climate), from the perspective of geotourism is very strong.finally, with Multi- criteria decision- making methods(Entropy and Saw) geosites were identified and prioritized. Findings also indicate priority of Shalamsh waterfall, Gravan calcic spring, residential region of Beavran, Zab sites and finally high plian of Vazneh.the survey showed in the superiority of geosites, natural and geomorphological indexes as visual attraction of the site and the uniqueness of the main phenomenon with the number of attraction within the geosites is important. Confirms for this reasoning is the Shalmash waterfall and Gravan spring geosites. The result also showed that parameters such as access to the site with space index and readiness to develop infrastructure despite the weakness of the city of sardasht faintly have been effective in prioritizing. Also, confirm for this result is the Vazne site that located at last priority. The final results showed that the development and improvement of management and human indices, particularly accelerating access roads(Sardasht- Bukan) and geometric correction and development of space in the geosites with the information necessary to create sustainble success geotorism.